Some say the Yankees own New York after they won the "World" Series this year. Apparently the Yankees agree. 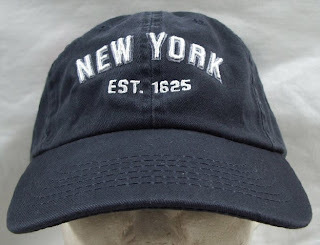 They have opposed an application to register the mark NEW YORK in the design form shown below, for hats and shirts [NEW YORK disclaimed]. New York Yankees Partnership v. Elidan Corp., Opposition No. 91192050. The Yankees rely principally on a Section 2(f) registration for the stylized mark shown below, for t-shirts and sweatshirts. The colors navy blue and white are claimed. So, who do you think would win this one, if it ever goes to a decision? Text Copyright John L. Welch 2009. Did MLB hire Leo Stoller to file all of these oppositions? My first reaction was that this was silly. But maybe not. If you jump down the rabbit hole into Wonderland, forget that New York is the name of a city and a State, forget that the New York Yankees are the name of one of that city's baseball teams, forget that New York City was established in 1625, and forget that Abner Doubleday and Alexander Cartwright did not invent baseball until the 19th century, then the two marks are undeniably similar and confusion is possible. In the real world, however, I doubt that anyone would look at defendant's cap and think New York Yankees. I think the applicant will strike out. The white lettering on a blue baseball cap would create actual confusion in a survey among baseball fans.